All this time we ladies thought going to McDonald's and ordering a burger and downing it with some fries was really turning the guys on, which is obviously why we all went there in the first place. But it looks like we have been terribly mistaken. Our milkshakes might in fact be driving boys from the yard Playland—at least if you believe this random guy named J.B. in Illinois who started what may be the single stupidest thread in Yelp history. Special mention must be made of Ana S., who quipped in response to J.B., "I'll be Burger King and you'll be McDonald's. I'll be doing it my way and you'll be lovin' it." Zing! 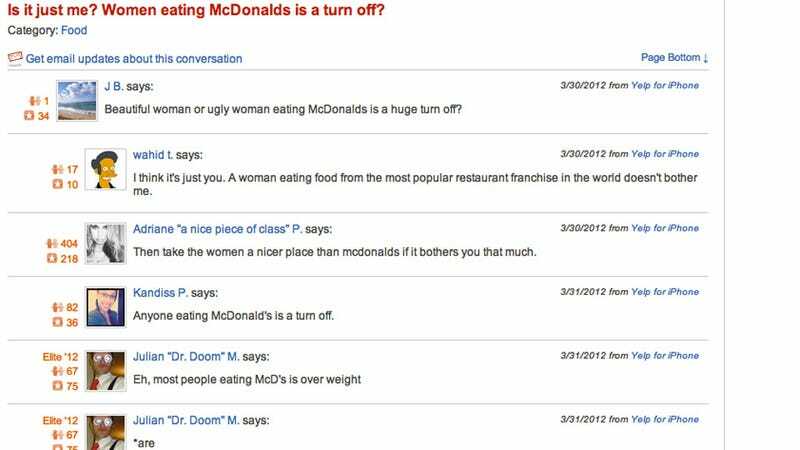 The good news is that the consensus of the respondents, which is about as scientific as it gets, seems to be that women, regardless of whether we are ugly or beautiful, are not posing any grave danger to men's bone zones by enjoying a little McDonald's from time to time. As for J.B., just wait until we unleash our Burger King Eyes on him.